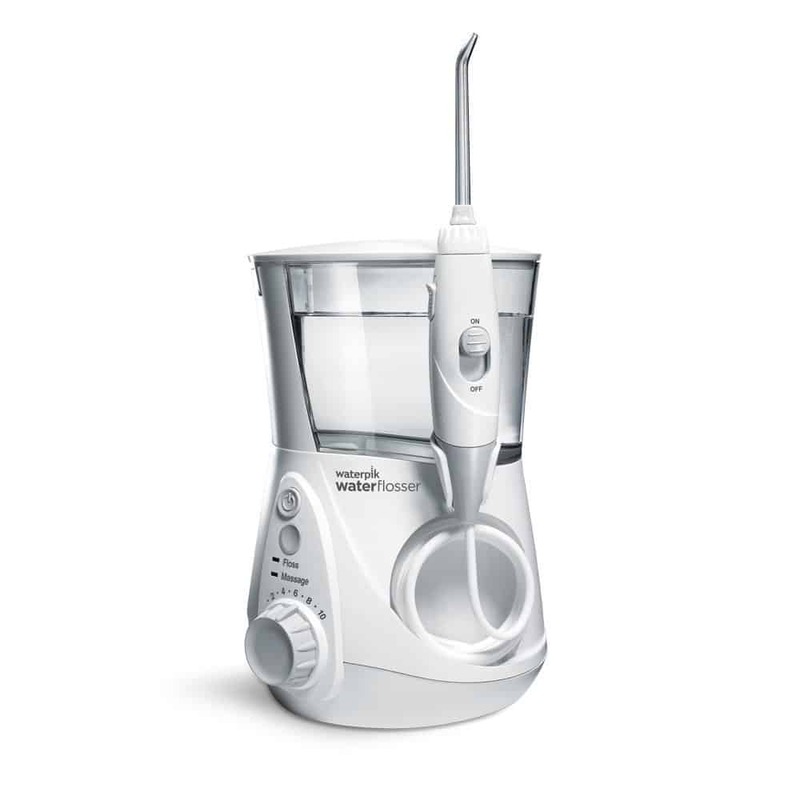 There are a lot of options out there when it comes to cleaning your teeth. All sorts of toothpastes are being created but most are pretty average. But we have tooth powders now that you can use to brush your teeth with and some people say they are better. And we would agree with them because I have actually used the Orawellness Shine powder myself with good effect. 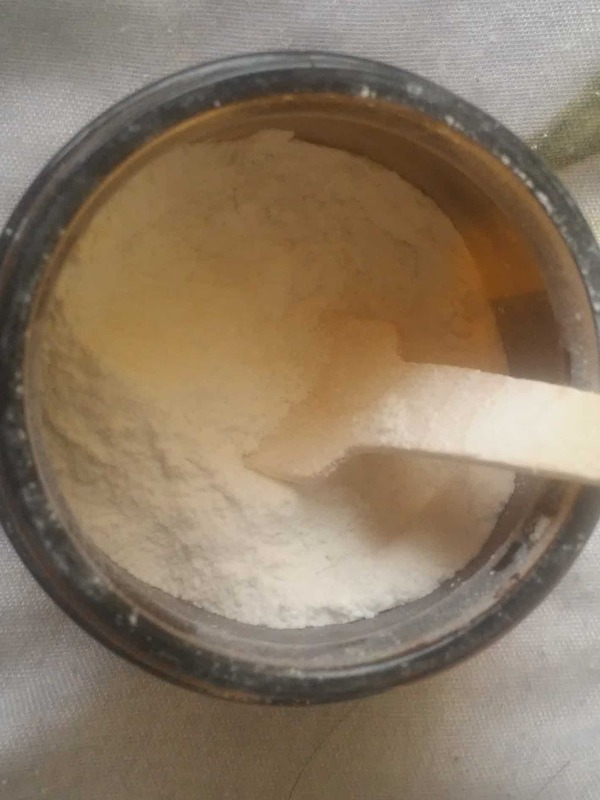 So in this review I will be explaining the features and aspects that make this tooth powder stand out from the rest. It could help fix your teeth problems! Why Use A Tooth Powder? Did you know that dental powder was in fact used in ancient times as an important dental care routine but in the last 30 years it was replaced by toothpaste so gradually the popularity diminished as companies started to heavily promote pastes. But studies have shown that tooth powders are actually more effective than toothpastes when it comes to removing plaque. One study carried out an experiment to see the difference between toothpaste and tooth powder. Thirty-six volunteer dental students were recruited for the experiment. After scoring, the subjects were randomly divided into two groups. The first group was asked to brush with toothpaste or tooth powder according to a split mouth protocol. The second group was asked to follow the same protocol except they were asked to use their finger instead of the brush. The results showed that plaque-removing efficacy of the tooth powder was higher whether it was used with brush or with finger. There was a significant difference between paste and powder users. What Is The Orawellness Shine Powder? It’s also marketed as a whitening powder, in fact the full name of the product is: Shine remineralizing tooth whitening powder. Being totally honest, when I used shine I did not notice any whitening which was a shame but there was a definite change in regard to remineralization. More on this later. The ingredients contained within it are all naturally derived which is a big bonus and considering the recent trend of healthy natural living, it is going to appeal to a wide range of people. Here is the link to the Orawellness Shine product if you are in a rush. There is a tiny bit of menthol in shine which is a volatile compound from the mint family. It is suggested to avoid mints as mint could disrupt a pregnancy and lower milk production. Shine also has minute amounts of many trace elements, some of them, heavy metals. We recommend you get advice from your midwife just so you feel more comfortable. 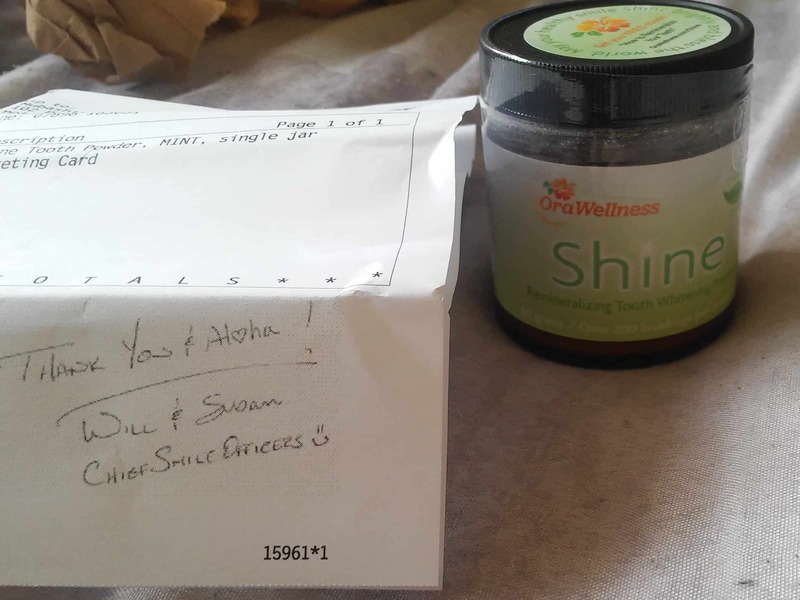 Will (co-founder of Orawellness) has stated on his website that he would be more than happy to offer shine to any of his family members that were pregnant or breastfeeding. That should tell you something! It’s perfectly fine for children to be using shine but that being said, shine contains small amounts of trace minerals which are considered dangerous to some. But these are naturally occurring in most soil based products such as clay and are considered safe. Unfortunately there are some animal products in this powder which make it unsuitable for people observing veganism. 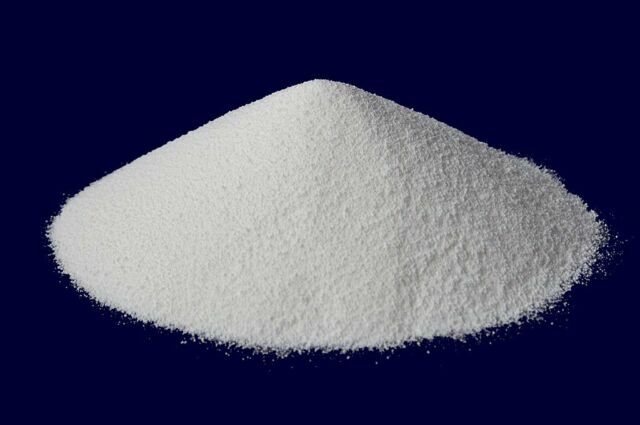 The Micro-crystalline hydroxyapatite is sourced from pure bone powder from New Zealand pasture raised cattle. hydroxyapatite is the naturally occurring mineral form of calcium apatite. up to 70% of human bone by weight is made from this mineral, so you can see why it is so important to teeth health. Xylitol is produced from birch trees found in north America and plays a critical role in delivering bio available minerals to the areas where tooth decay is present. Did you know that some manufacturers add calcium lactate to chewing gum containing xylitol. The reason being it speeds up the teeth healing process. Proof of this is a study which was done on 2 groups of people. One group was the control specimens and the other group were given chewing gum containing xylitol + calcium lactate 4 times a day for 2 weeks. After the 4 weeks were up the results were calculated using x-ray spectrometry and they found that teeth remineralization was greater when chewing gum on a regular basis. How Does The Orawellness Shine Work? It works the same way a toothpaste does but the ingredients contained within it are what separates it from the rest. They are more or less what the teeth require to start rebuilding themselves and remineralizing. To be absolutely honest, I was a bit hesitant at first to place a lot of powder on my teeth but it worked. Using more gives better results in my opinion. Natural Ingredients – It’s not just the fact that it has natural ingredients in it, it’s more to do with the quality of the stuff that goes into shine and more importantly the ingredients can be absorbed by the teeth to help make them stronger. Easy To Use – It takes the same amount of effort to use this tooth powder as it takes with toothpaste but the benefits are far greater. Just watch the video above to see the ease at which Will applies it. 365 Day Money Back Guarantee – This might be the only company out there which gives such a big guarantee and it shows us that they really do believe in their product. 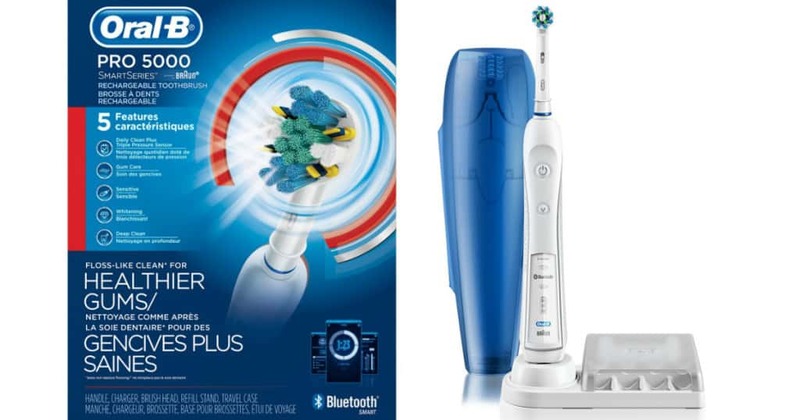 Different Flavours – They currently do 2 different versions of the product. The first option is a mint flavour which is always a popular seller but if your not too keen on the strong taste then you can opt for the cinnamon flavour. Does Not Whiten Effectively – Shine is also marketed as a whitening product but it isn’t really good at it. Honestly I didn’t buy it for the whitening effect, I brought it to help remineralize my teeth and make them strong again which it has done. Packaging Issues – We noticed some people complaining about the packaging and the amount of powder that was within a glass jar when they received it. The jar was half empty which is pretty bad. But the team at orawellness are very supportive and if you encounter similar issues take a picture and send it to them and they will give you a replacement free of charge. As of February 27, 2019 there are 681 reviews on their main website with an average rating of 4.5 stars out of 5. That’s a lot of people who have brought shine and the important thing is, they enjoyed the experience. 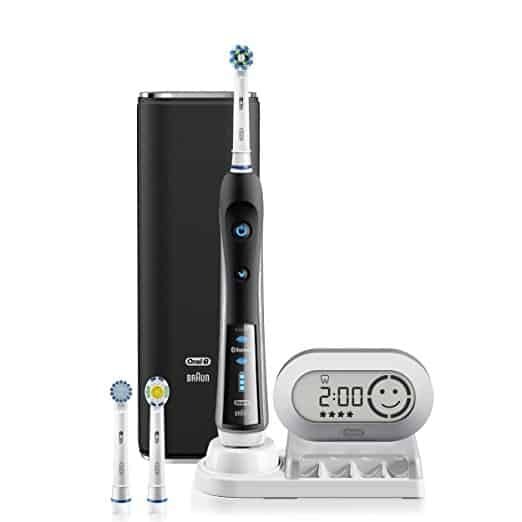 Reading through the reviews we got the sense that nearly everyone noticed results within the first month of using it and some people (not many) noticed their teeth got whiter which is a bonus I guess. However there were some negatives which are more to do with personal preference and side effects. For instance one person started getting canker sores every time he used it. That’s not normal at all which leads us to believe he had some sort of adverse reaction to some of the ingredients. This is quite rare and for the most part the product went down well with consumers. But most noticeable of all was the sensitivity on my bottom front tooth was gone after only a weeks use. If your someone who has a problem with any of the the things mentioned above or just want something different to try then this is a good solid option which won’t let you down. If you buy a single 60 gram jar it will cost you $25.94 and this will last you for 200 uses approximately. It might seem expensive but you need to consider the specialised ingredients that go into the product and the intensive manufacturing process it undergoes. You can buy it from either Amazon or Orawellness but we highly recommend you buy from Orawellness because they have a MASSIVE 365-day money back guarantee and it’s cheaper than buying from amazon where it is priced at $29.94. Plus amazon only have a 30-day return policy. Here is the link to the Orawellness Website where you can go read the reviews and make your purchase. 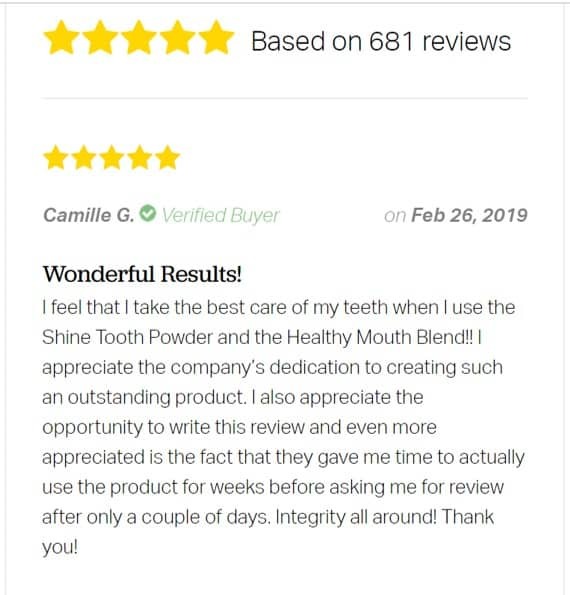 There you have it, in this Orawellness Shine Review we have given you all the important information regarding this tooth powder which will now enable you to make an informed decision on whether to buy it or not. Honestly, I tried it myself and noticed some great changes, the most extravagant one being the sensitivity on my bottom front tooth vanished after just 1 week of using it. I honestly believe it’s the ingredients that make all the difference. Microcrystalline hydroxyapatite and Calcium Lactate are seriously powerful and are exactly what the teeth need to rebuild and remineralize them. It costs $25.94 which isn’t too bad and the jar will last up to 200 uses which is approximately 3-4 months. That’s a good deal. Other customer reviews were positive as well with most saying they noticed changes within a month and a few even whitened their teeth, however this is more of a bonus for most people. I myself did not notice any teeth whitening whilst I was using it. We highly recommend it to anyone who is in need of remineralization and stronger teeth. If your someone who wants an alternative to regular toothpaste, you too could benefit from using the shine tooth powder. 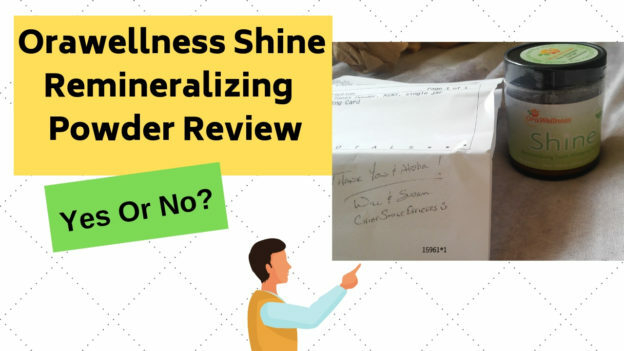 I have read your article on orawellness shine and i am impressed by the information, it’s seems to be very impressive for remineralization purposes. I am going to buy one as soon as i have the money for it. i will let my relatives and friends know about it too. Thanks for stopping by Tawhid. Let us know how it goes for you once you get your hands on it. Thanks for making this important post on orawellness, this is the first time I’m hearing about this alternative for effective mouth cleaning as all i have been using is the usual toothpaste. But reading this post i really would love to try this for a change and see its effectiveness. I’ve never heard about this powder but you have really played out the pros and cons of this. I like how it is being made from natural ingredients. It’s also at a good price in my opinion. One question. I’m a little curious about the feeling. Does it have a slippery feeling on the teeth? The first time you use it the sensation is slightly weird, like detergent powder when it is slightly wet but you soon get use to this. It tastes quite refreshing and the slippery feeling is not a problem.